#BBNaija, the official harsh tag for Big Brother Naija Season 2 double wahala has been trending on social media for week now because of the ongoing reality TV show which is exclusive to DSTV and GoTV. 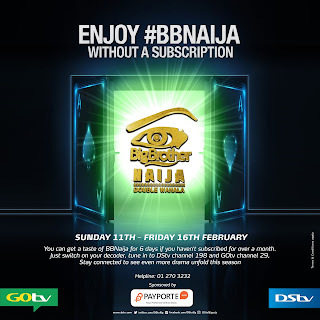 "Enjoy #BBNaija without subscription. Just turn on your decoder and watch the drama. It is the season of love. Open house ends on Friday, 16 February. Stay connected to GOtv"
Currently, Big Brother is giving out free six days to view the Big Brother channel without any active subscription on DSTV and GoTV. So if you haven't turn on you GoTV/DSTV decoder, this is the time to do so. Promo runs till 16 February 2018. Do a rescan on your Gotv decoder to get Big Brother Channel 29, if it shows any errors measage just do a reset via advance installation option in settings.